One more deadly weapon. Making people a little uneasy with their military genius is something this Super power is quite good at. 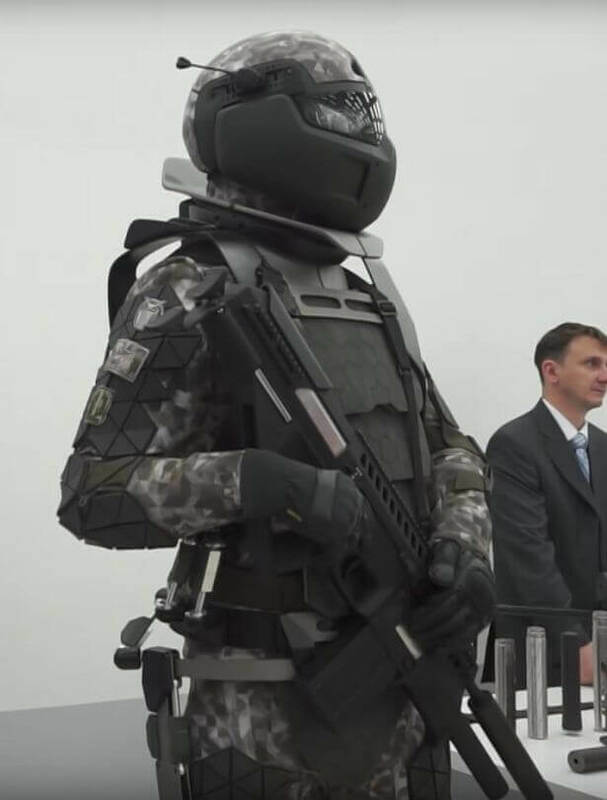 In their newest military revelation, Russian military unveils combat suit that is designed to make soldiers faster,stronger and deadlier on the battlefield. It's like something out of a Hollywood movie. Imagine having something like this coming at you in battle. It's enough to cast fear in the hearts of the enemy even before any shots are fired. The Russian armed forces may soon be fitted with this intimidating and hi-tech exoskeleton body suit. Looking more like outfits from starship troopers or Robocop, the futuristic styled combat suits which were designed and developed by the state-owned Central Research Institute for Precision Machine Building, feature a remarkable design that targets improvement in a soldier's strength and stamina. It will enable soldiers lift heavier equipment and run or March for longer distances without tiring. Merging robotic technology with human soldiers produced a far more efficient and effective military for Russia. The all black suit is also bullet-proof armoured and the helmet sports a tinted visor designed with a built-in heads-up display. Really Robocop-like if you ask me! According to the deputy chief of weapons systems Oleg Chikarev, the combat suit is still a prototype that should go into production in the next two years. This emerges after Trump and Putin drew harsh critism for planning to start a joint cyber security unit! A plan that was discussed during their 'much too cosy' first time meeting at the concluded G20 summit in Hamburg Germany. However, not to be outdone by any degree, the US military are also developing an Iron Man-like suit designed to give 'superhuman strength'. to troops. God help us all—Lol!